Sameh Makram Ebeid handed me his business card with the words, ‘I hope I get to use this again.’ Underneath his name it spelled out ‘Member of Parliament’. He took it back momentarily and penciled in an additional word in Arabic: ‘Dissolved’. Ebeid is one of two elected Coptic parliamentarians, and won his seat from the Red Sea district under the banner of the Egyptian Bloc. The choice of the Red Sea was personal – he owns a home there and likes the region – but also political. Ebeid estimates 75% of governorate residents hail from Qena in Upper Egypt, which is his family home. The choice of the Egyptian Bloc as a liberal coalition was natural, as Egyptian politics post-revolution evolved into a secular-Islamist confrontation. The Bloc is a coalition consisting of the Free Egyptian Party, the Egyptian Social Democratic Party, and the Tagammu’ Party. Under Egyptian law, however, Ebeid does not have to belong to any of these parties. Though his official parliament membership papers list him as a member of the Bloc he ran with them as an independent candidate. Perhaps this is fitting. 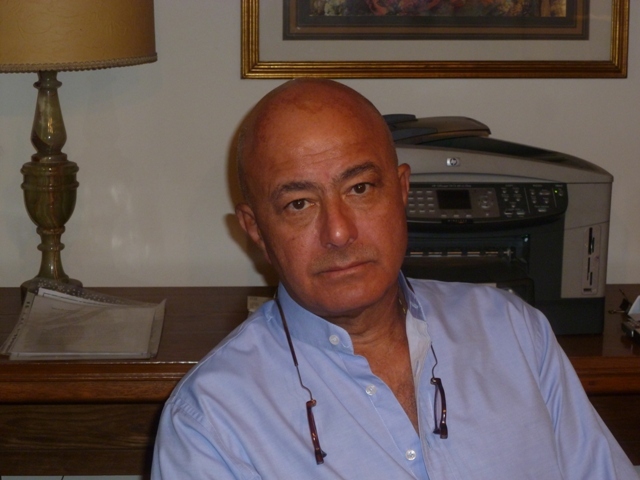 Ebeid hails from the historic Egyptian family associated with the Wafd Party in opposition to British colonialism. Saad Zaghloul, a Muslim, and Makram Ebeid, a Copt and Ebeid’s ancestor, contributed to the founding of modern Egyptian politics along nationalist lines without any religious distinction. The party’s logo depicts both the Christian cross and the Muslim crescent. Ebeid had previously served as the Wafd Party’s assistant secretary general and member of the political bureau, but resigned during the chairmanship of Sayyid el-Badawi, who won party elections in 2010. Ebeid’s major source of contention was Badawi’s cooperation with the Muslim Brotherhood. He brought on prominent Islamist Suad Salah, and sought to place her on the religion and human rights committee. Compromises such as these turned the Wafd, he said, into a typical ‘wishy-washy’ party. After the revolution Badawi entered the Wafd into a coalition with the Brotherhood, though they withdrew at the last minute. Badawi’s election was ‘clean’, states Ebeid, but like the parliamentary and presidential elections, this does not mean they were not manipulated. Ebeid is critical of the electoral machinery of the Muslim Brotherhood which distributed food packages in poor areas before elections. Similarly, many Salafi sheikhs stated voting for Islamists was part of obeying God’s will. Yet Ebeid testifies that in his election monitoring he did not discover fraud; certainly not in comparison to past elections. For this he puts no stock in the conspiracies which say Ahmed Shafiq was the actual winner of presidential elections over Mohamed Morsy. ‘As long as Shafiq did not contest the election, I have to accept it as correct. ‘If he knew the elections were rigged and he did not voice this, it is treason and he should be court-martialed. Even so, Ebeid took issue with the recent visit of Hillary Clinton to Egypt. His critique was not about clandestine US support for the Brotherhood, as many liberals and Copts advanced. On the contrary, in coming to Egypt the secretary of state was just doing her job. ‘I don’t see any reason why Clinton should not visit the president of Egypt; these are the true forces of Egypt. Did they push SCAF to accept Morsy? I don’t know and nobody knows. But it is actually her job and duty to come. As a politician Ebeid has the right to be frank. His criticism of Clinton, conversely, is in her conduct as a diplomat. The failure in tact concerned the nature of her visits to political forces. It was right for her to meet Morsy and the Brotherhood, Ebeid believed. It was right for her to meet with Salafis. It was right for her to meet with the military. But it was not right for her to meet with ‘Copts’. ‘You should not meet with the Copts as Copts, but as part of the liberal movement, as the third way between military and Islamist, and bring in non-Christians. ‘If you start segregating the country you’re making a big mistake. For this reason, Ebeid believes it was correct for liberal and Coptic forces to boycott the meeting with Clinton. He himself did not receive an invitation, but he supported the decision of those who did. As for the current political situation in Egypt, especially on President Morsy and the Muslim Brotherhood, Ebeid is critical as well. ‘There is no such thing as the Freedom and Justice Party. They call themselves the political arm of the Muslim Brotherhood, which is the real force. ‘So far I have not seen Morsy act as the president of Egypt. We have to see if he will elevate himself above parties to be the president of all Egypt. I hope he will do this. Though Morsy is not directly involved in the crucial issue of the constitution, Ebeid witnesses the Brotherhood special agenda here especially. ‘The constituent assembly [which will write the constitution] was a trick. It was agreed to be a 50-50 Islamist-secular split, but they did not go into the details about parties or people. Ebeid’s criticism is not just of the Brotherhood, but of the process itself. As media reports the progress the constituent assembly makes on the constitution, Ebeid prefers not to comment on details until he sees an official text. Yet he is not reticent to make his views known on certain issues. ‘The first three articles are most important as they define the identity of Egypt. What are we, a secular country or an Islamic country? ‘What does the word shura [‘consultative’, proposed by Islamists as part of the definition of the state] mean? It has been debated for the last fourteen centuries. Putting the word there is not just semantics, it means something. ‘As for the right of Christians and Jews to refer to their own sharia: What about non-believers, what if we have an Egyptian Buddhist? Within the debate of these issues, Ebeid was careful never to assert, or even speculate, secret deal-making between political powers. The accusation that someone was an agent of America, for example, has been a political tactic for the last thirty or forty years, he stated. He wanted nothing to do with this pattern. Yet there was one area where he opened the door just a little. It is the crucial error which resulted in the muddled transition Egypt is experiencing. ‘If there was a deal, the deal that harmed Egypt was made in March of last year in the national referendum. This reversed everything, putting parliament first, then president, then constitution. ‘Deal, negotiation, agreement, whatever; this is what destroyed the whole eighteen month process. A monumental taks indeed i.e. governing Egypt fairly.